Enjoy the fresh, just-out-of-the-can, PLAY-DOH aroma as part of a year-long celebration of the beloved modeling compound’s 50th birthday. The 1-ounce, spray bottle fragrance is meant for ‘highly-creative people, who seek a whimsical scent reminiscent of their childhood.’ “One of PLAY-DOH compound’s most notable characteristics is its scent,” said Leigh Anne Cappello, vice president of marketing for the PLAY-DOH brand. “When you open a can of PLAY-DOH compound, you are instantly transported back to childhood. 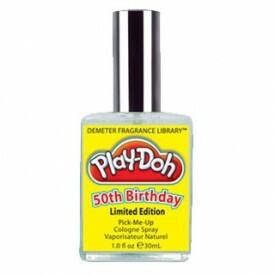 What better way to celebrate the 50th birthday than by bottling the scent for adults everywhere to enjoy as a reminder of their youth.” PLAY-DOH® brand modeling compound was invented in 1956 at Rainbow Crafts, a Cincinnati-based cleaning company. Scientists there were trying to develop wallpaper cleaner when they discovered the now iconic children’s toy. Realizing the compound’s play potential, the company introduced it at the American International Toy Fair in New York City in 1956. PLAY-DOH compound was first available only in one color and size, an off-white, 1.5 pound can. Now, a half a century later, kids can explore their imaginations and express their creativity with up to 50 colors. The formula for PLAY-DOH compound still remains a closely-guarded secret to this day.